When I want something quick and easy this is the kind comfort food I will make. This udon noodles soup is super easy. Pour water into a saucepan and bring it up to boil. Add chinese leaves, fish balls and wakame. 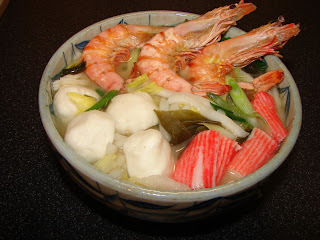 After about 1 - 2 minutes add udon, boil for another minute add crab sticks and prawns. When it is hot and bubbly. Turn heat off add miso paste, spring onion, sprinkling of sesame oil and ground pepper. If the soup is not salty enough for you, can add a dash of soy or dashi stock. ** if the seafood is frozen you can soak and defrost in some warm water for 5 minutes. Other than the above mix you can add anything you like, cooked chicken, beef, mixed seafood etc.